This supplement is similar to a hormone, which the body produces naturally as well and as a prescription goes under the name of Prestara, Fidelin and Fluasterone. It is banned in competitive sports and not tolerated for the use of athletes, by both college and olympic committees! Supplement versions are manufactured from wild Mexican yam. It is also available as a dietary supplement to treat aging, or to treat female, or male, complaints. There are no evidences to support these claims though, and prior to taking it, talk to your physician! An androgen steroid hormone naturally produced in the body by the adrenal glands. Do not confuse 7-Keto DHEA with DHEA. Capsule and tablets available both as prescription (200 mg) and non-prescription (10-, 15- or 25-mg) products; typically 200 mg for lupus. Do not take doses higher than 25 mg without advice from a physician. Effects of long-term use are unknown. Helps control lupus flares; increases the blood level of DHEA. What we know: Natural DHEA levels have been found to be low in people with RA and lupus, particularly in postmenopausal women, as well as men with ankylosing spondylitis, perhaps due to corticosteroid use. DHEA may help regulate the immune system and control inflammation. In people with lupus, DHEA treatment may reduce disease activity and flares. Studies found it allowed doctors to lower women's corticosteroid dosages. 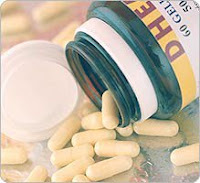 DHEA also appeared to counteract bone loss caused by medication and increase bone density. Long-term safety, overall effectiveness and appropriate dosages have not been established. Stomach upset, abdominal pain and high blood pressure, as well as acne. It also decreases levels of 'good' cholesterol (high-density lipo­protein, or HDL) and may cause facial hair growth, voice deepening and changes in menstrual pattern. DHEA can also increase insulin resistance for people with diabetes, and exacerbate liver disease. Use is contra-indicated in men with prostate cancer and women with uterine fibroids. Supplements of DHEA should not be given to teenagers, children, or infants. The use of this hormone is often not recommended in healthy young adults, below the age of 30 years. Caffeine, alcohol, or smoking, may have an affect as well on the working of this medication and/or supplement. To be honest with you, after reading all this, I would not recommend taking it, unless your doctor prescribes it to you. It all sounds too iffy to me and the negative side-effects seem to be as great as the positive effects this supplement may have. But..., that is my opinion on it and I am more then willing to discuss it. We all have our opinions and understandings, which is good. As long as we are willing to discuss and listen to each other. By considering and respecting each other's opinions and thoughts, we may come to a better and more full understanding. We may not fully understand the meaning of God's word. That does not make it less true though. Discussions and sharing opinions and understandings, may lead to more knowledge and wisdom. corry, I hope you are doing well today. I am still learning the truths of God's Word. I pray that I will always be a willing student. Blessings. Aww, that is so sweet, thanks so much I will pass it on. Goodmorning dear sis, missed ya around. Good to see you and we hope all is well. Did you know that there is an interesting correlation between the production of Cortisol and DHEA? When we are stressed (any negative emotions, including worry, fear, frustration and anger) our body goes through 1,400 physical and chemical changes. Cortisol, "the stress hormone" is being produced. What is interesting to know is that when Cortisol is high, DHEA, "the Vitality Hormone", is low. When we transform our stress, we lower the Cortisol and naturally bring up the production of DHEA, so we feel better emotionally, mentally and physically. What this has meant to me is far fewer flare-ups and when I have them I am better at pain management. Welcome and thanks for your comment. I had no clue! I enjoyed reading your blog and the tips to turn stress around are very helpful. Thank you for sharing, we all can use a bit less stress.